Balcony Views is a new concept of magazine, and a new direct response opportunity – NOT JUST ANOTHER MAGAZINE. Every new enquiry and lead we receive at Balcony Systems will receive as part of the information sent to them a copy of the magazine! Therefore in addition to reaching thousands of professionals as shown below, our partners are placing their information in front of thousands of new live leads and enquiring individuals over the course of the next six months. These are thousands of leads that we at Balcony Systems spend a pretty penny to source for ourselves. Partners in the magazine must have or supply a product or service that is innovative, interesting and of high quality. We aim to make the magazine a keeper’s item and one with real and relevant information. It is not a “product book” as many magazines are referred to these days. 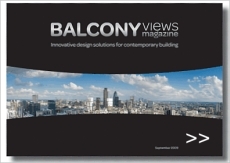 Balcony Systems invites selected suppliers to join as Balcony Views Publishing Partners. A stunning 3 page feature including images of your products or services accompanied by a one page advertisement. Publishing Partner editorial, images and advertisement are client supplied. For in-house commissioning using Balcony Views’ established network of expert designers, journalists and photographers rates are available on request.